I intended for these nails to look like a bandana, if you didn't read the post title. The gradient that I did for the base of these nails looked super awesome, I probably should have taken pics of it before I stamped over it (oops). I started with a base of OPI Manicurist of Seville. Then using this tutorial, I sponged on L'Oreal Haute Couture, a vampy blackened burgundy jelly. I stamped on the design using Konad Special Polish White and the Shany plate SH20. I really like this image, the big flower in the middle is really pretty and I love the little dotty bits that fill in the empty spaces on the design. Some of my stamp jobs were imperfect, and I tried to remedy them by freehanding on the pieces that didn't transfer to my nail. It wasn't a foolproof solution, but at least the image looked complete! What do you think? It kinda looks like a bandana, right? I am curious to see what this might have looked like if I had stamped with black instead of white. 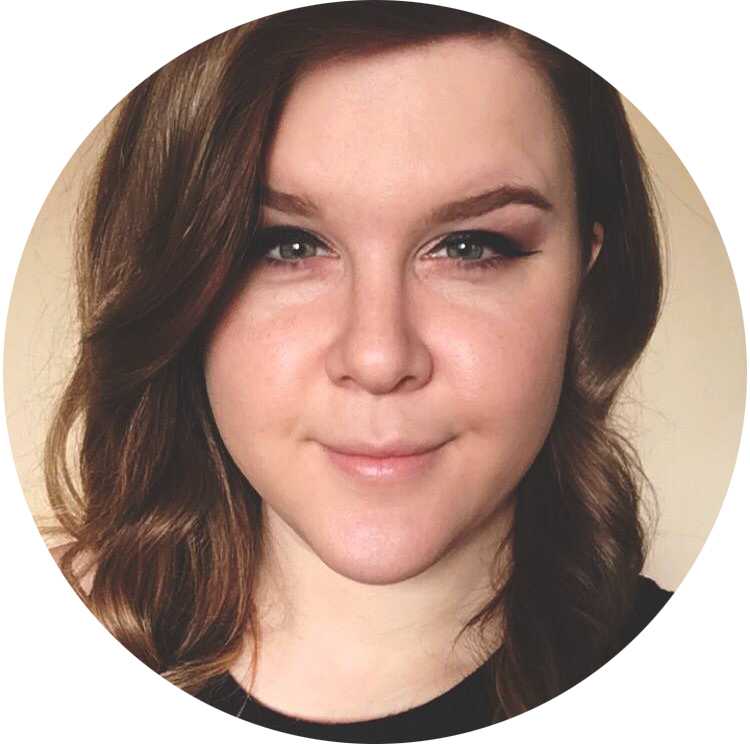 It might have looked less like a bandana, but the black would have partially faded into the darker side of the gradient, which could have looked cool! Stamping is definitely an area where I could improve a bit. I don't do it very often; I usually choose to freehand. I see so many ladies do incredible things with stamping, though, that it makes me want to do it more! 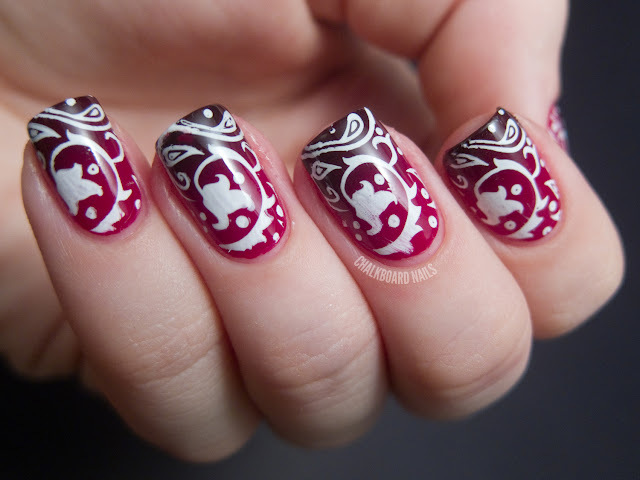 I think I would like to start incorporating more stamping into my nail art routines. This is SO friggin awesome! I love this and the gradient is gorgeous! You do the best nails! love the gradient and it does look like a bandana pattern! Great idea! I think you did a great job at making it look like a bandana. You did a great job! Super cute! This looks amazing! Very well done! Wow, the gradient color is totally awesome :D! 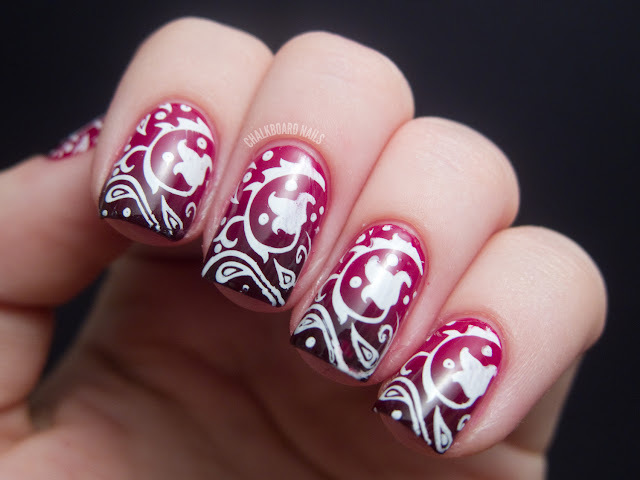 I'm a fan of those bandanas so I like the stamping as well ;D.
I just love this manicure! The colors you chose go so well together and I also like the pattern you stamped on top! I used this same pattern a few weeks ago to create and abstracted layering with Color Club green's. I think this stamp is lovely. Not quite like a bandana but very cute. I love the gradient as well! Girl, I don't know where you see flaws in this manicure but there aren't any in my opinion! GORGEOUS! omg! 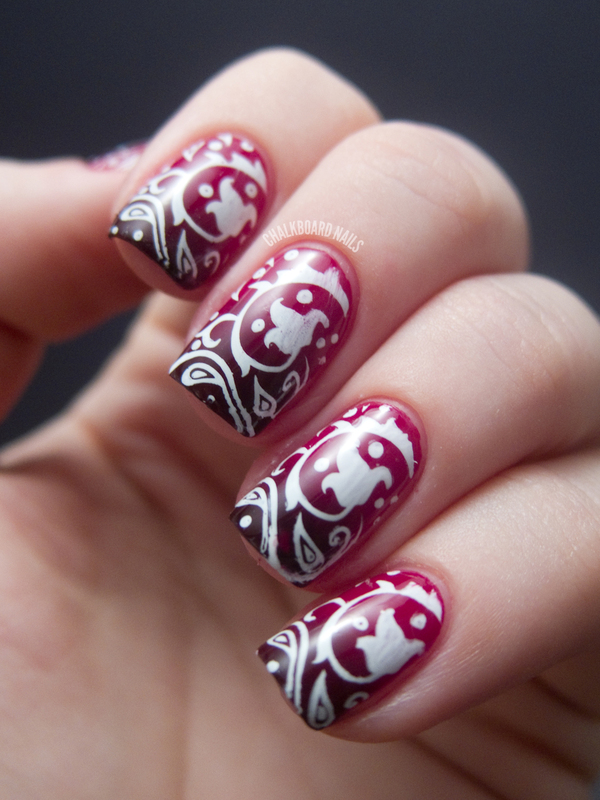 awsome design, color and nails!!! super cute! 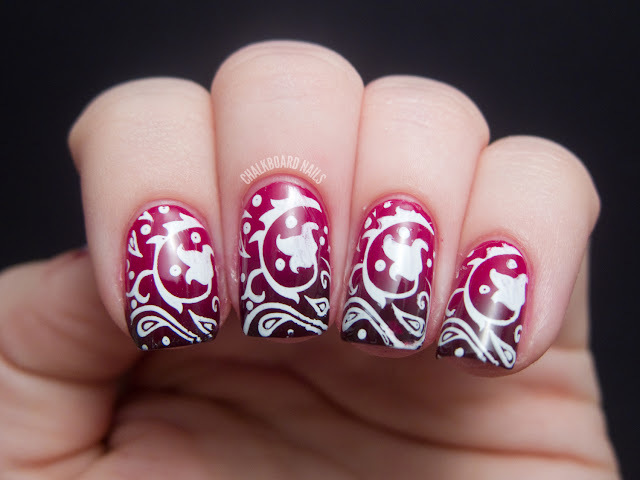 I would love to see more stamping from you sarah!